When I was a kid I attended a nondenominational church that predominantly hired Baptist pastors, so I was raised with a strong Baptist background. I memorized a lot of Bible verses as a child that have stayed with me all of these years. Back then, the only version of the Bible that was available was the King James Version (KJV) and the poetic language (think “Shakespeare”) of King James English (the time period in which the King James Bible was originally commissioned in 1604 and translated into English) made the memorization process easier, at least for me. While I rarely read that version today–my most favorite version is the New International Version (NIV, 1984, 2011), and also the New King James Version (NKJV) which was commissioned in 1975 by Thomas Nelson Publishers—those verses I memorized way back then come flooding back to my mind in the King James English style. However, as it is stated in the New King James Version, I have often replaced “Thee” and “Thou” with God/You, He, or Him to give it a more personal feel, as in, for example, the 23rd Psalm, specifically verse 4, which states in the KJV, “Yea, though I walk through the valley of the shadow of death, I will fear no evil for thou art with me; thy rod and they staff, they comfort me.” The NKJV states the last half of that verse: “I will fear no evil for You are with me, Your rod and Your staff, they comfort me.” When I memorize verses today (which I don’t often do like I did as a child), I use the NKJV. Back then, we were taught that we were soldiers of the cross, which is something that isn’t often mentioned anymore. War means a battle of some type, but the idols that have replaced that battle today are well entrenched in many of our churches and our lives. The “war” image has often been replaced with the “idols” in our culture or repetitive talks about how to improve our self image which keeps the focus off of Jesus (and genuine repentance) and on us all the time. And that (focusing on self) is the first battle we have lost. Other battles we lose include our love of money and materialism, and/or knowing how to look and act the part of being an “acceptable” Christian in the eyes of others and/or according to the dictates of our church and/or the culture at large. And any personal sacrifice on our part is often disconnected or not even mentioned from the Jesus we have been taught to know today. In fact, we have so given in to the idols of our day that we’ve already lost battles we didn’t even know we were in because we aren’t paying attention to how the Bible would really have us live. And the instructions are fairly clear in the New Testament if we would only read them and take them seriously. Unfortunately, too often we want everything our culture has to offer us and we don’t even try to fight against temptation. As a child in Sunday School class, I remember seeing a large, life-sized picture of a soldier wearing battle armor–like a Knight–on display at the front of the classroom. Each piece of his armor stood for something very specific. 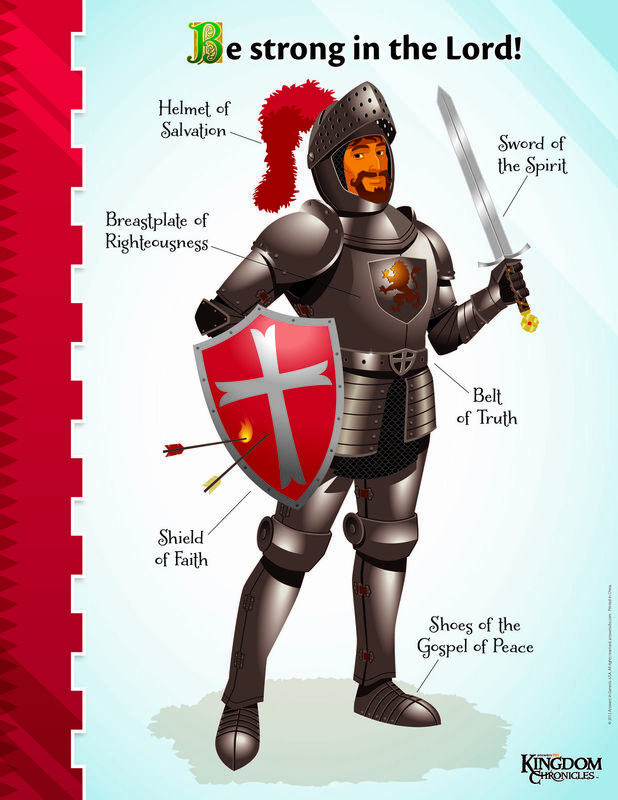 Ephesians 6:10-18 includes the description of what each piece of the armor represents. For example, the breastplate stood for righteousness that comes from God. The belt stood for truth. The helmet stood for salvation. The shield, which was the most important piece, stood for faith. And the sword stood for the Spirit, which is the Word of God. And we were admonished to always pray and be watchful with all perseverance. Do kids get taught this today? Do most adults attending church today even know about it? And if not, what does that say about the church they are attending, and about their children and what they aren’t being taught? I dare say that Harry Potter gets more attention from the younger generation then Jesus Christ does. And technology has replaced the power of God in their lives because they never learned about the power of God available for them from anyone in the first place, and technology and all that can be done with it and learned from it is readily available to fill that void. Also, I was scanning the children and teens book section in a popular bookstore chain the other evening and it tells a story all of its own about where the younger generations are headed. And the battle for our children is being lost in a very big way that spells disaster. There is a brand new book that just came out that tackles the issues head on that are going on in our culture today. The book is titled, “Onward: Engaging the Culture Without Losing the Gospel” (2015), by Dr. Russell Moore, who is President of the Ethics and Religious Liberty Commission (ERLC) of the Southern Baptist Convention, the nation’s largest Protestant denomination. The Wall Street Journal called him “vigorous, cheerful, and fiercely articulate.” Dr. Moore is the author of several books including, “Tempted and Tried” (a personal favorite of mine), and he can be found online at russellmoore.com, erlc.com; and on Twitter @drmoore @erlc; on Facebook at facebook.com/russellmoore, facebook.com/ERLCSBC, and on Instagram at instagram.com/russellmoore. We seek the kingdom of God, before everything else. We connect the kingdom agenda to the culture around us, both by speaking it to the world and by showing it in our churches. As we do so, we remember our mission to oppose demons, not to demonize opponents. As we advocate for human dignity, for religious liberty, for family stability, let’s do so as those with a prophetic word that turns everything upside down. The signs of the time tell us we are in for days our parents and grandparents never knew. But that’s no call for panic or surrender or outrage. Jesus is alive. Let’s act like it. Let’s follow him, onward to the future. The days ahead will be different than ever before. We may be seen as strange in American culture. We will be forced to articulate things we once could assume. That is nothing to wring our hands over. That is no call to retreat or to surrender, and it’s also no call to keep doing it the way we’ve been doing it, except at a louder volume. If so, Onward Christian Strangers. Our message will be seen as increasingly freakish to American culture. Let’s embrace the freakishness, knowing that such freakishness is the power of God unto salvation. Let’s march onward with the confidence of those who know that the gospel didn’t emerge in Mayberry, and doesn’t need a Bible Belt to sustain it. Jesus, in continuity with the prophets before him and the apostles after him, didn’t shy away from moral confrontation. But he refused to leave it at the kind of superficiality we all crave. The disciples weren’t allowed to congratulate themselves for being free from adultery and murder, because Jesus in his preaching drove the law deeper and deeper into their consciences, exposing the roots of the kind of internal adultery and murder it is much harder to identify much less to wash away. The apostle Paul, likewise, demonstrated the moral degeneracy of the Gentile nations (Romans 1:18-2:16), but he didn’t allow the Jewish believers to step back and applaud him for his calling sin “sin.” He asked whether they, too, were guilty of the same things they censured in their foes (Romans 2:17-29). The point of this apostolic preaching wasn’t to evoke smug grins from the audience, but to shut every mouth with the law and to drive every heart to the gospel (Romans 3:9-31), (p. 199). The gospel offers a complete forgiveness of sin, and not only that, a fresh start as a new creation. But both Jesus and the apostles warn us this can easily be twisted into a kind of license. Faith is not real without repentance, and faith is not like that of the demons, simply assenting to true claims. Faith works itself out in love. Faith takes up a cross and follows Christ. A notion of grace apart from lordship can provide a cover for all sorts of wickedness. . . (p. 201).
. . . I wonder how many people don’t listen to our gospel message because they assume they don’t “look” like the kind of people who would be Christians–namely shiny, happy Republicans. And, shamefully, how many times do we filter our gospel preaching and our social witness to people who would, upon baptism, be able to pose nicely for our ministry advertisements? How often do we assume the good news of Christ is a message just like a political campaign or a commercial brand, targeted toward a demographic of a certain kind of buyer? Jesus will build his church, with us or without us. But if we are going to be faithful to him, we must share his mission. This means we don’t just talk about lost people; we talk to them. And we don’t talk to them as enlightened life-coaches promising an improved future, but as crucified sinners offering a new birth. The hope for the future is not that Christianity will be seen as more respectable or more influential in the sectors of American power. The hope for the future is churches filled with people who never thought they fit the image of “Christian.”. . . . We’ve come not to call just those who look like whatever Christians are supposed to look like, but the whole world. If the church is powered by the gospel, then the Body of Christ has tattoos (pp. 213-214). These few excerpts barely touch the surface of the information available in this book on so many critically important issues going on in our culture today. Dr. Moore goes into precise details without overwhelming the reader and he does so with clarity, passion and compassion, with a message for the Church in America at this time in history. Ordering information for Dr. Moore’s new book titled, “Onward: Engaging the Culture Without Losing the Gospel,” available through several retail distributors, can be found at this link. Dr. Moore’s new book is an excellent place to start in understanding how to travel the changing landscape in America without losing the gospel of Jesus Christ. The gospel will never be totally lost in any culture as Jesus stated that very fact to Peter in Matthew 16:18 when he told Peter, “And I tell you, you are Peter, and on this rock I will build my church, and the gates of hell shall not prevail against it.” But that doesn’t mean we should just sit back and watch or wring our hands in despair or ignore all the signs. It’s time for action, not retreat, and we should start that action with prayer, asking God to show us what He would have each of us to do. And don’t ever forget what Jesus said. . . .
And the gates of hell. . .
Shall not prevail against it. . . .